More Effective Than Wool Blankets! 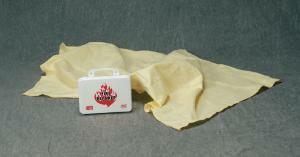 Fire blankets made of a Nomex/Kevlar blend that is a tough, soft, fire and heat resistant fabric. These blankets can be used to smother and contain small fires or as a protective wrap in the event of an evacuation during a fire. These blankets won't melt, drip, burn or support the combustion of fire in the air, and are affordable and light weight. Perfect for industrial plants, homes, schools, laboratories, welding shops, restaurants, boats, auto repair shops, hotels and anywhere that small fires may occur. The plastic storage case has a glow in the dark decal for easy location when the power goes out.